A lovely Evesbatch common. The commons are in great condition and many of them, I think, have more than a touch of the wildie. Evesbatch isn't only about carp - here's nephew Steven with a PB perch - 2lbs on the dot, which took luncheon meat by the lilies. Another lean and mean Evesbatch common. 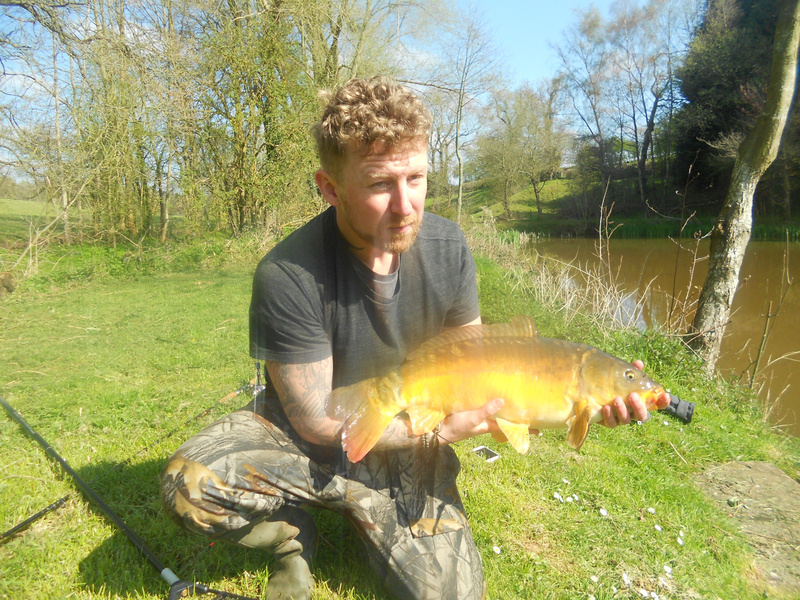 They are some of the hardest fighting carp I have encountered. My best common of April 13th, 2019 - 8lb 10oz only, but simply gorgeous! It is a fact that, each time my nephew Steven fishes Evesbatch Bottom Lake with me, he achieves a PB of some kind - and yesterday was no exception. This time, it was the number of carp in a single day - a whopping and outrageous 23, plus a near 2lb perch into the bargain. His largest carp was a low double and he had a few nines in the mix of well. I would like to report an equally hectic session - but my tally was a more modest five carp to 9lb 4oz and a bream... Steve's approach of circling the pool, endlessly stalking, was the right approach yesterday. We had the pool to ourselves. But I decided to stay put, in a spot where the deep channel rises to a shelf, and I suppose I was hoping for a big fish. Alas, it was not to be - but I still really enjoyed myself, waiting and occasionally catching, while marvelling at the energy and stamina of Steven, who fished his heart out for more than eight hours, often crouching still on the bank, like a crafty young heron. 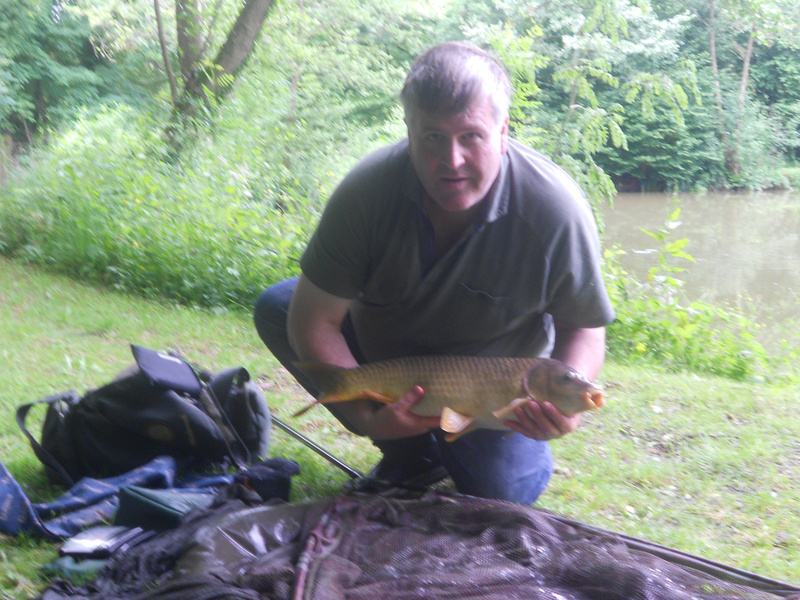 I caught all my carp that day on luncheon meat, with the exception of one off the top, on a small piece of crust. The carp were not in a surface mood - smacking free offerings into little bite-sized pieces, but rarely taking any. 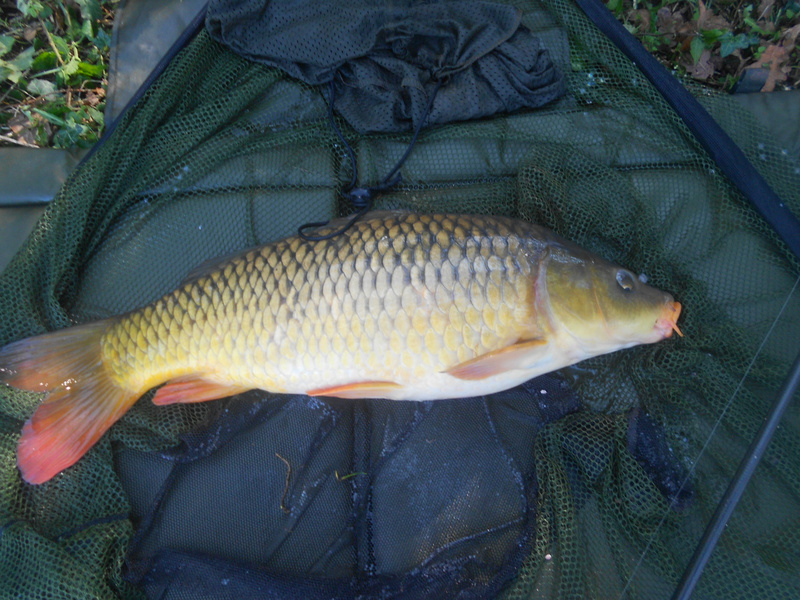 For tactics, Steve used a float - a crystal waggler, I think, and he fished meat and prawns over free offerings of corn. I fished mainly over micro-pellets, using the sight-bob method. I missed two or three "unmissable" takes until I realised the hook had gone seriously blunt on me! Unusual with modern hooks..and a new hook too! In all, it was great to be back at Evesbatch, for a memorable day with great company - as always. 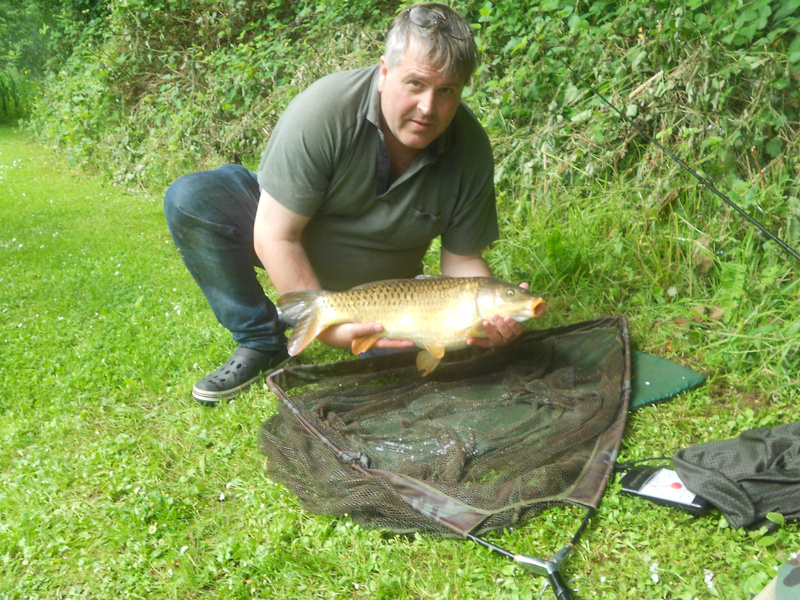 What got into the carp at Evesbatch Bottom Lake yesterday (Friday June 8, 2018)? They performed such amazing runs against the clutch and fought every inch of the way to the net. 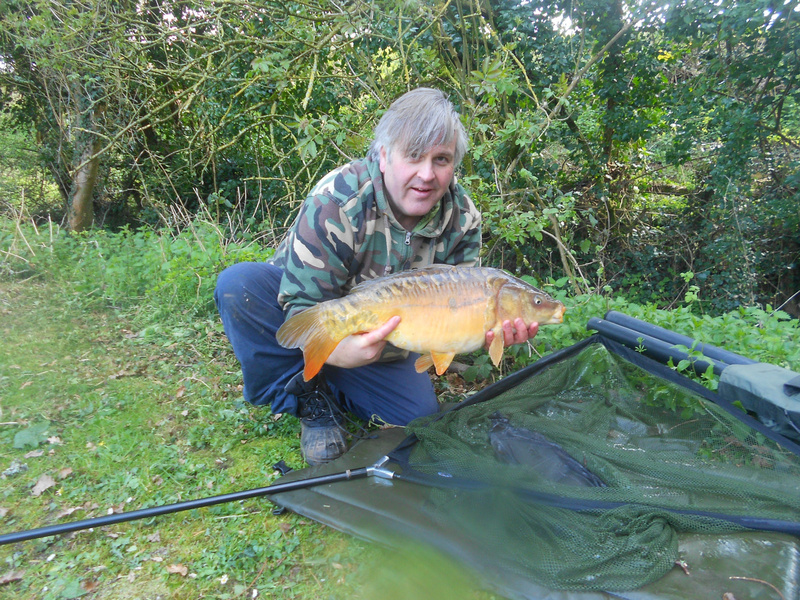 I was fishing Evesbatch again with my nephew Steven, who is passionate about angling. Rain had fallen quite heavily in the night: perhaps raising the oxygen levels in the pool and giving the carp an incredible boost of energy. Another factor was the fact that we were mainly fishing the shallows, so the carp could only run when hooked, not dive deep and hunker low. We both suffered one or two hook pulls - with Steven losing a particularly large fish which he had fooled on floating crust by a lily bed. As it transpired, we caught no really big fish - Steven caught six, a nice mix of mirrors and commons, to around 6.5lbs, and I managed eight to 7lbs 14oz - also a nice mix of mirrors and commons, with the commons, I'm pleased to say, being the larger fish. Aside from Steven's excellent company, what really pleased me yesterday was the fact that we caught fish off the top, and we caught fish on the float - my two favourite methods. For the float I used a sight-bob, of course - and eventually I found that fairly large hunks of roughly torn meat - enough to cover a size 7 hook, was the way to go. The bites when they came were simply unmistakable - with the sight bob vanishing from the surface at a rate of knots. I had about six inches of line on the bottom, in about 2.5ft of water, and I fished close in. 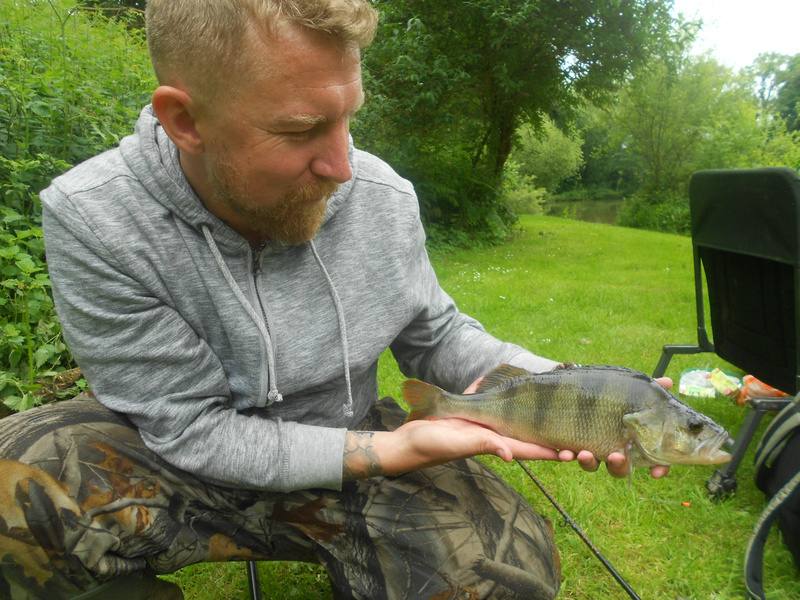 Special mention must be made of Steven's perch - which was a PB at 2lbs, and which fell to float-fished luncheon meat. I understand they go even bigger there - the lake record currently standing at 3.5lbs, which is something to dream about. Happy Days!